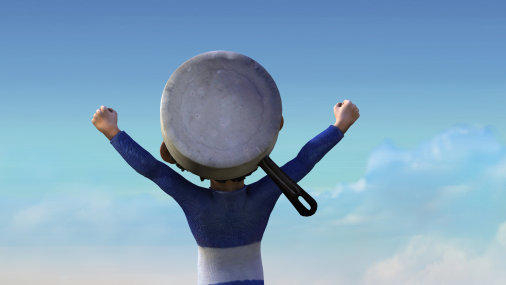 "The Gallant Captain" (Australia) will be playing at the 10th annual REDCAT International Children's Film Festival. Our favorite children's film festival is celebrating its 10th anniversary this year! 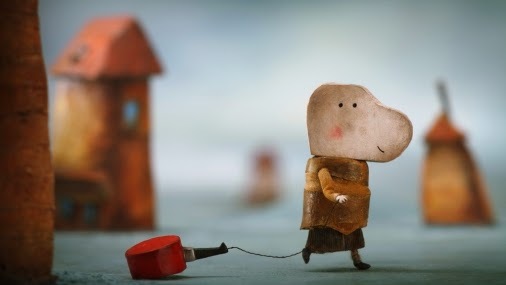 REDCAT International Children's Film Festival is once again bringing films from all over the world -- including Germany, Brazil, Sweden and France -- to families in the Los Angeles area, beginning this weekend. The festival kicks off on May 2 and runs Saturdays and Sundays through May 17. This year promises to bring the same mix of charm, wonder and adventure from the eyes of filmmakers around the world. We can't wait! Will and I meet Paddington Bear at the Los Angeles Zoo. 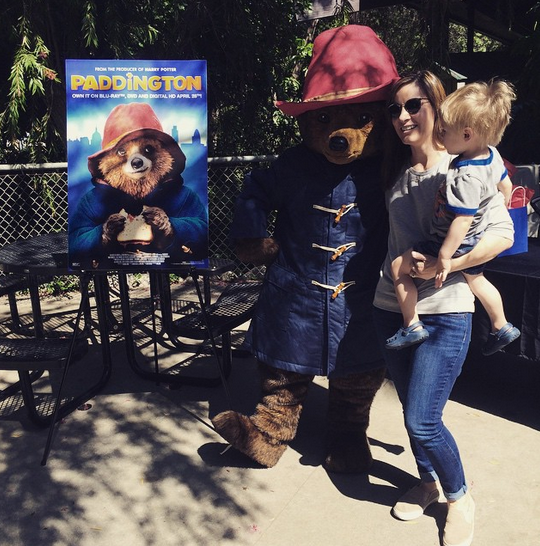 Paddington Bear made a special appearance at the Los Angeles Zoo this weekend in honor of the digital, Blu-ray and DVD release of the film. In addition to the marmalade-loving bear himself, there were bear-shaped sandwiches for the kids, as well as activities and a photo booth. Will even got to make his very own red hat. While the movie, starring Nicole Kidman and Hugh Bonneville ("Downton Abbey"), is already available for digital viewing as of April 17, the Blu-ray and DVD editions of the film (released by Anchor Bay Entertainment and TWC-Dimension) will arrive in stores on April 28. 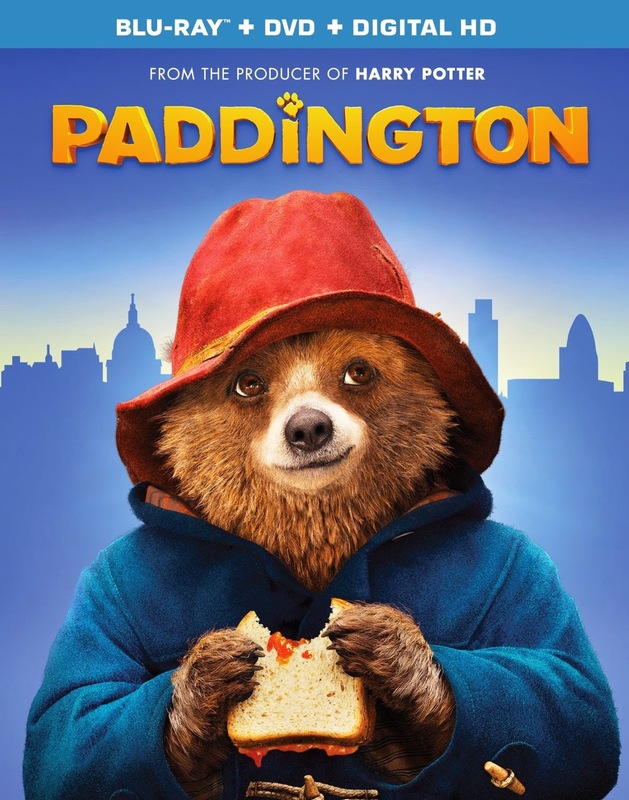 Based on the books by Michael Bond -- which CC loves, by the way -- "Paddington" tells the story of a Peruvian bear (voiced by Ben Whishaw) who arrives in London with a label around his neck that reads, "Please look after this bear. Thank you." In his search for a home, he befriends the Brown family, who give him a temporary place to stay. But it's when he comes into contact with a museum taxidermist (Kidman) that things take an even wilder turn. Will was excited to meet Paddington in the, well, fur, and gave him high-fives and a couple of hugs, but he definitely wanted to experience the red-hatted bear from the safety of my arms. Will was definitely a fan, though. He kept calling for "Padd-ton." Will folds red construction paper to make a Paddington hat. Will also loved making the red hat out of construction paper and touring the LA Zoo to see the baby animals. And speaking of baby animals, now is a great time to visit the zoo. The baby animals now in residence include a chimpanzee, a koala bear, a hippo and a kangaroo, which you can actually enter to name. Just be sure to use the hashtag #NameOurRoo. My suggestion? Roo LA LA. Will asked to ride the "fishie" on the LA Zoo carousel. Click below to download "Paddington" activity sheets for the kiddos. While there are lots of great toothpastes out there for kids, I just found out about hello and had to share. The packaging, with its vibrant colors and clever designs, will draw you in, but it's what's on the inside that counts, right? CC and Will tried out bubble gum and green apple, and I've gotten a thumbs up from both. (I think the fact that it's different from the usual mint variety is also a plus.) Not only that, but the ingredients are natural -- no dyes, artificial sweeteners or flavors. But it's not without powerful ingredients like fluoride to help prevent cavities and strengthen enamel. The best part for CC? The clever writing on the back of the tube. "Hello there. You're awesome," one tube says, while the other offers up, "Hello there. You're cool." "I love this, Mom," she said, "because I'm awesome and cool." And a confidence-booster (or reassure-er :) to boot! You can find hello at Target, starting at $2.99. Blake Lively and Michiel Huisman in "The Age of Adaline"
When it comes to family, Blake Lively makes sure that's a top priority. The actress and mom of 4-month-old daughter James (with husband Ryan Reynolds) made that endearingly clear during a recent video interview, where I sat down with her and co-star Michiel Huisman to talk about their new film, "The Age of Adaline" from Lionsgate. Lively talks about how close she is with her mom and gives a shout-out to a couple of special guests, who also happen to be relatives. She also hints at possible future siblings for little James. Check out the full article and video on mom.me. In the meantime, here's my Instagram post from the interview. "The Age of Adaline" (PG-13) opens April 24. Kristen Bell (aka Anna) shows off "Frozen" toothpaste and a toothbrush. Congrats to Katrina, who won the "Frozen" Crest + Oral-B Pro Health Jr. prize pack! Thanks to everyone who participated and for the great toothbrushing tips! We all know how hard it is to get our kids to brush their teeth. CC brushes with Oral-B JR. and Crest. While CC and Will are in the habit of brushing twice a day, they could still use some incentive to brush for the full two minutes. Enter "Frozen," Crest + Oral-B Pro-Health JR. and a cool new Disney Magic Timer app that occupies kids while they brush -- so they're not just watching sand fall in a tiny hourglass. Because that's not exactly, well, fun. CC and Will had the chance to try out two Disney-themed electric toothbrushes from Oral-B Pro-Health JR. and the new minty "Frozen" toothpaste from Crest. "I want Cinda-lella," he's been saying in the mornings and before bed. CC had lots of fun with her Ariel-themed electric toothbrush, too. Those definitely help increase the time they spend on their teeth. What I would definitely recommend is the app, which offers up a fun little video for kids to watch while they brush. Let's just say, Olaf's in it. And if they're still not convinced, check out the video below, with Kristen Bell (aka the voice of Anna in "Frozen"). I'm giving away a "Frozen" Crest + Oral-B Pro-Health JR. toothbrush and toothpaste prize pack! To enter, please leave a comment with your child's favorite "Frozen" character, or share a tip on how you get your kids to brush for #2MagicalMinutes. For more chances to win, follow me on Twitter and retweet this giveaway with the hashtag #2MagicalMinutes. I'm at @la_story. Or you can "Like" the L.A. Story Facebook page and share the giveaway. Good luck, and I will announce the winner on Friday, April 17! Mother's Day is right around the corner, and it's easy to get caught up in the madness of the holiday, especially with all the cool gifts out there. Does she want jewelry? Would she go for a cute handbag? How about a meaningful memento that celebrates family, young and old? Luckily, all of those offerings are available on The Bradford Exchange Online. 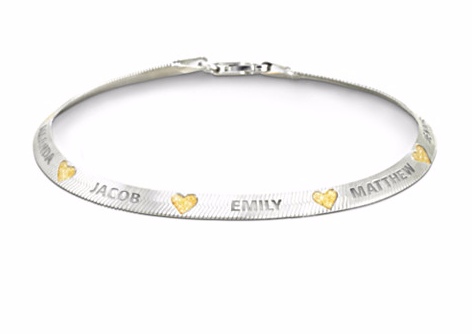 The site offers some of the best Mother's Day gifts for moms who love to keep family as close as they can -- and that can mean having family names engraved on stylish bracelets and rings. 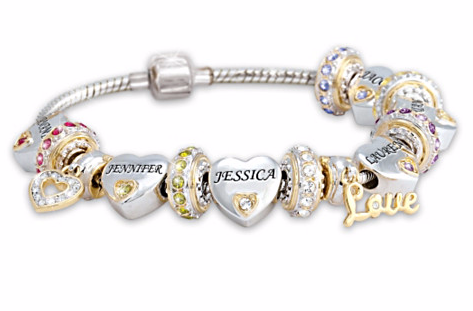 The Forever in a Mother's Heart personalized bracelet (top) is $129, the Family Blessings engraved bracelet (above left) is $119, and the emerald and diamond white gold ring is $348 (a definite splurge). 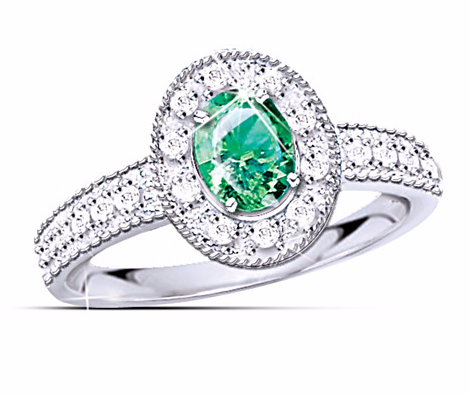 If your mom isn't into jewelry or prefers handbags or other mementos, those are available, too! Check out the site's Mother's Day offerings here. Meet Will's new favorite train friends! 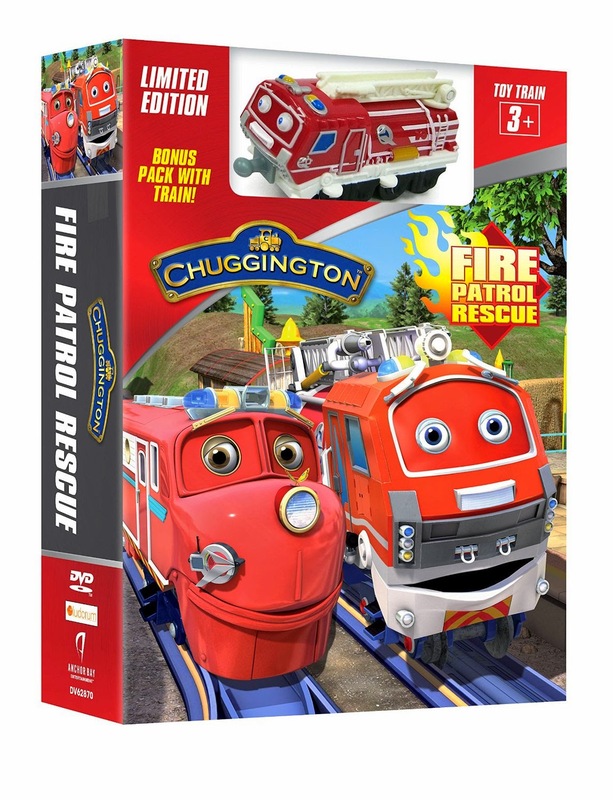 The "Chuggington: Fire Patrol Rescue" DVD pack ($9.99), complete with bonus train, from Anchor Bay Entertainment had Will (and even CC!) enthralled with kid-friendly, action-packed adventure. And as a parent, I was impressed with just how many fire-safety tips and everyday lessons were included in the six episodes. The preschool-focused show features Wilson the "trainee" learning how to be a leader during a fire safety drill. While some trains don't want to listen and a few mistakes are made along the way, Wilson learns that giving clear, firm directions helps others to pay closer attention and follow through. Wilson also teams up with new friend Asher to learn how to use a powerful fire hose in a rescue. While there's a bit of a learning curve -- as there is with most everything -- Wilson sticks to it and even helps out another train with his newfound knowledge. Bonus material includes coloring pages, new character spotlights and an extra "Bonus Badge Quest" episode. What I appreciated about the episodes were the clear lessons and safety tips that came from the trains as well as the human crew. 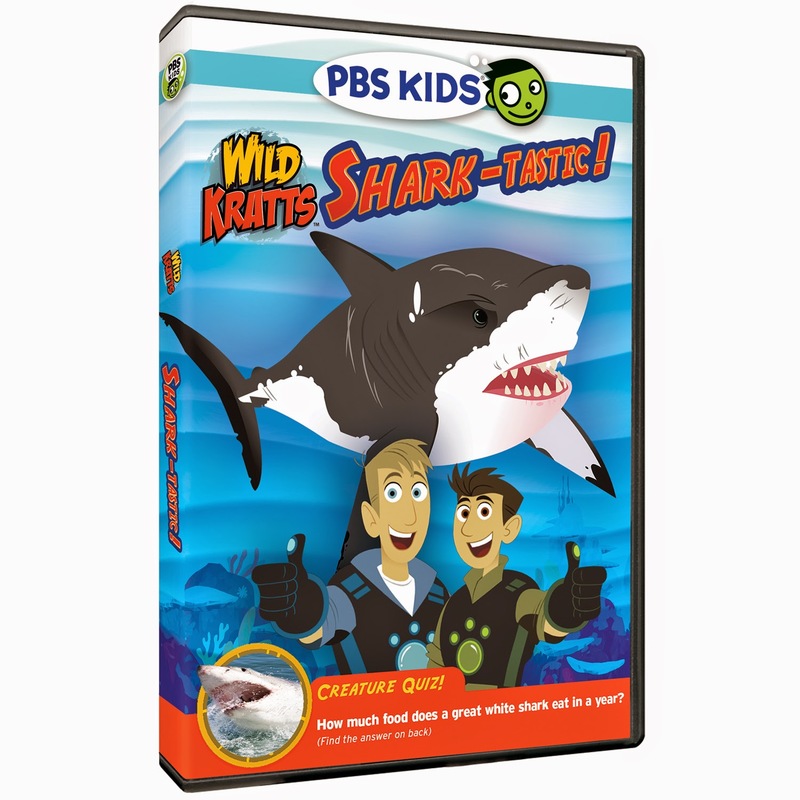 The DVD even starts off with a tip that tells kids to hold an adult's hand while crossing the street. Will loves taking this Chuggington train to bed. Will loved playing with the train included in the DVD pack. It's now become part of his bedtime pals that he takes with him to sleep. He also started saying "Oh bumpers!" -- an expression Wilson uses a lot to express frustration -- during the show. So cute! Will wears his Junior Firefighter badge. He was also a big fan of wearing a "Junior Firefighter" badge while watching the show. It's safe to say that we'll be learning a lot more about Chuggington. And don't be surprised if you find yourself singing the theme song, "Chugg-ing-ton, chugga-chugga-chugga," for days to come! CC shoots a few goals at the "Science of Hockey" exhibit at Discovery Cube LA. 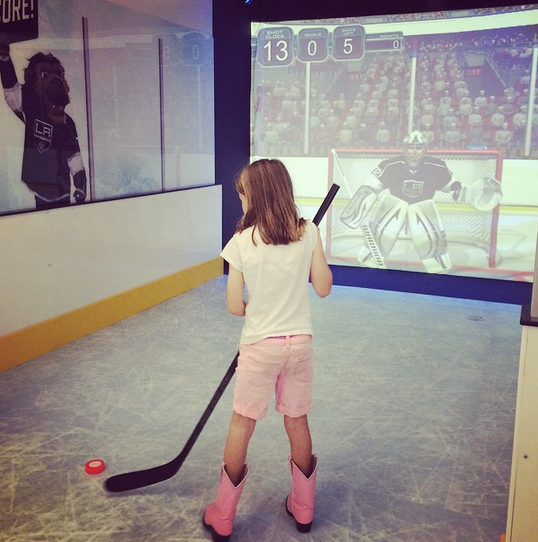 It is officially spring break in our house, and if you're looking for a (literally) cool place to take the kids, visit the newly opened "Science of Hockey" exhibit at Discovery Cube LA. In addition to all the fun activities at the hands-on museum in Sylmar -- "Thomas & Friends Explore the Rails," an awesome rock wall, an interactive grocery store and more -- the "Science of Hockey" is yet another exhibit that gets kids moving and learning. CC got to practice shooting a few goals in the "You Be the Shooter" section, and then got to try her hand at being goalie in the "You Be the Goalie" section. Kids can even try on hockey gear for size. CC gets her goalie on at Discovery Cube LA. Created in association with the Los Angeles Kings hockey team, the permanent exhibit mixes math and science with the sport itself. Kids can also help get a player out of the penalty box by correctly answering a series of hockey questions related to math and science. CC also enjoyed designing her own (digital) jersey. Let's just say it was a lot more colorful than the traditional Kings jerseys. There's also a replica locker room that invites visitors to learn about nutrition and training through interactive games and consoles. Even with all of that, Will loved climbing on the replica Zamboni machine the best while turning the knobs and steering wheel. How many kids have dreamed of doing just that? 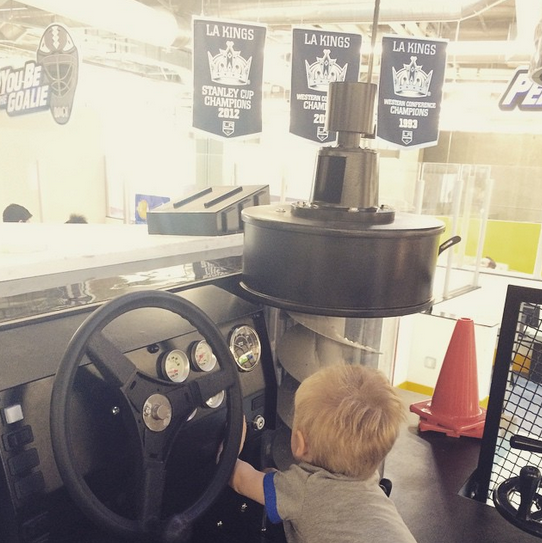 Will got behind the wheel of the replica Zamboni at the "Science of Hockey" exhibit. Fun for kids who love sports, fun for kids who love to explore science and math, and definitely fun for kids who just like to try things out for themselves, the "Science of Hockey" exhibit is a family-friendly must-see. And that's just one exhibit at Discovery Cube LA. Remember, there's always the rock wall! 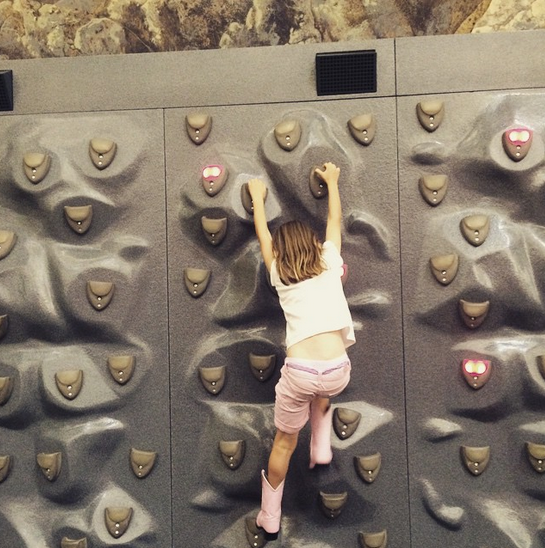 CC climbs the rock wall at Discovery Cube LA. And right now, tickets are only $10 for adults and kids! Tickets: $10 for adults and kids through June 30. Kids ages 2 and under are free.